When will be Dragons' Den next episode air date? Is Dragons' Den renewed or cancelled? Where to countdown Dragons' Den air dates? Is Dragons' Den worth watching? Dragons' Den, an original CBC Production and audience favourite, returns to delight viewers for a new season.Aspiring entrepreneurs from across Canada vie for a coveted spot in the Den to pitch potentially profitable business investments to some of the nation's most successful tycoons. The Dragons use their own money and know-how and have the power to catapult companies into home-grown business success stories.Every episode theatre and venture capital collide. Stakes are high as good deals may be rewarded, but there's also the risk that bad ideas will get burned. Dragons' Den offers the audience a front-row view as the country's top business moguls wheel and deal with entrepreneurs who dare to brave the Den. A flashy demonstration is presented to get the Dragons off their feet; car salesmen attempt to steer their pitch in the right direction; meat packers believe their business is a cut above; sparks fly in the Den. Dragons' Den next episode air date provides TVMaze for you. 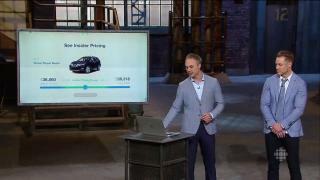 EpisoDate.com is your TV show guide to Countdown Dragons' Den Episode Air Dates and to stay in touch with Dragons' Den next episode Air Date and your others favorite TV Shows. Add the shows you like to a "Watchlist" and let the site take it from there.